The time has come to take a look back at the weekends boot spots and here we found everything from boot changes, to unique colourways. On top of that you can also look forward to a reunion with a true Unisport boot spot favourite, when he once again took us all by surprise. There were also some wild boot designs in and among, as well as, special customisations and a début for the Adidas CAFUSA-ball. Paco van Moorsel (FC Groningen)  Pelé Sports Trinity 3E SL SheOne Limited Edition We start today's boot spots in Holland, where a pair of the wildest boots entered the fray. It was the gentleman above, that on top of being a part of our boot spots, can also boast the name of the week. Paco sported a pair of the wild Pelé sports Trinity 3E SL SheOne Limited Edition, that is the top nice lightweight boot, which was given a completely unique look and design, thanks to the graffiti-artist, SheOne. This boot has to be a contender for best looking boot of the year, purely on the background of it being so outrages, in a good way. 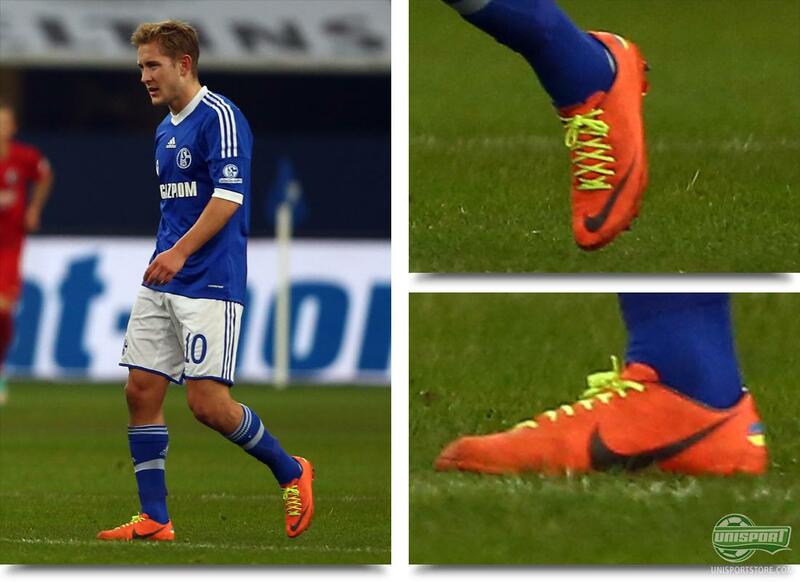 Lewis Holtby (Schalke 04)  Nike Mercurial Vapor VIII Mango In the Champions League the young German/English prodigy has been very loyal to Nike's control boot, the CTR360 Maestri III ACC White/Volt/Court Green, but in his games in the Bundesliga it's a different story. 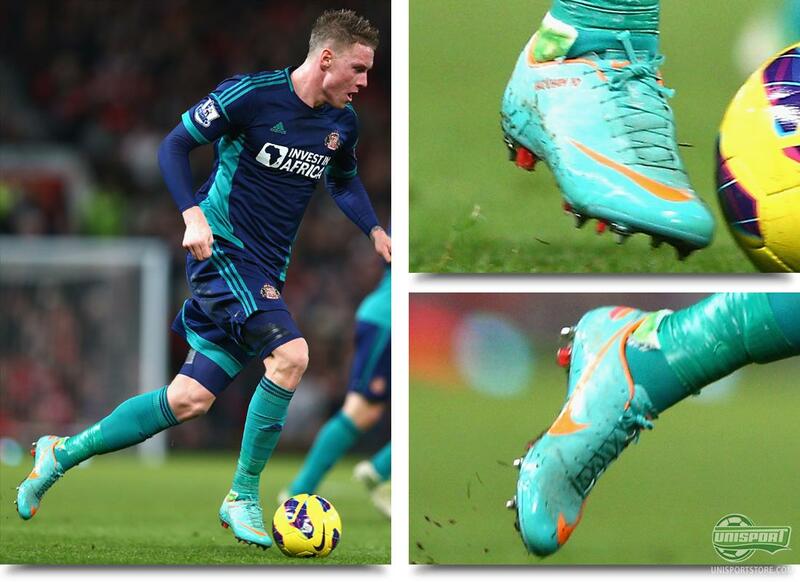 Here he has been showing off his tremendous talent, in a pair of Nike Mercurial Vapor VIII Mango. Furthermore he has pimped them up with some Neon coloured laces, or should we say Volt coloured, because as the sharpest boot spotters probably have noticed, these are most likely from his CTR360 Maestri III. Paolo Guerrero (Corinthians)  Nike GS2 ACC White/Black Custom We now take the long journey from central Europe all the way to the far east of Japan and turn our attention to the Club World Cup. Here Chelsea suffered a surprising defeat in the final to the Brazilian champions, Corinthians, and were especially threatened by this gentleman above. He scored the games only goal in a pair of Nike GS2 ACC White/Black, that was otherwise exclusive to the #GS2SQUAD. 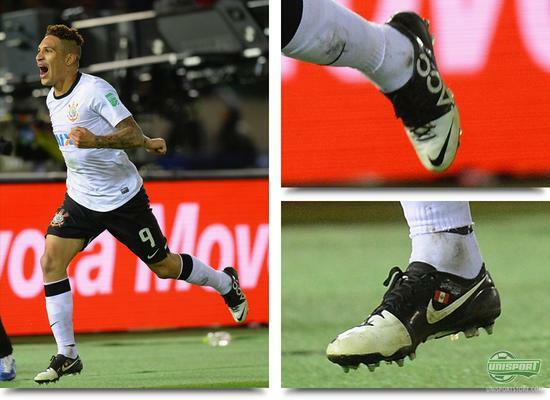 Guerrero has not bought them himself, because as the soleplate shows, he has been given a stud-configuration, that is otherwise reserved for the professionals. Jeremy Menez (Paris Saint German)  Adidas Predator LZ White/Blue/Yellow Custom Jeremy Menez is a man with a serious abundance of pace, but he has also got a very distinct taste in football boots. 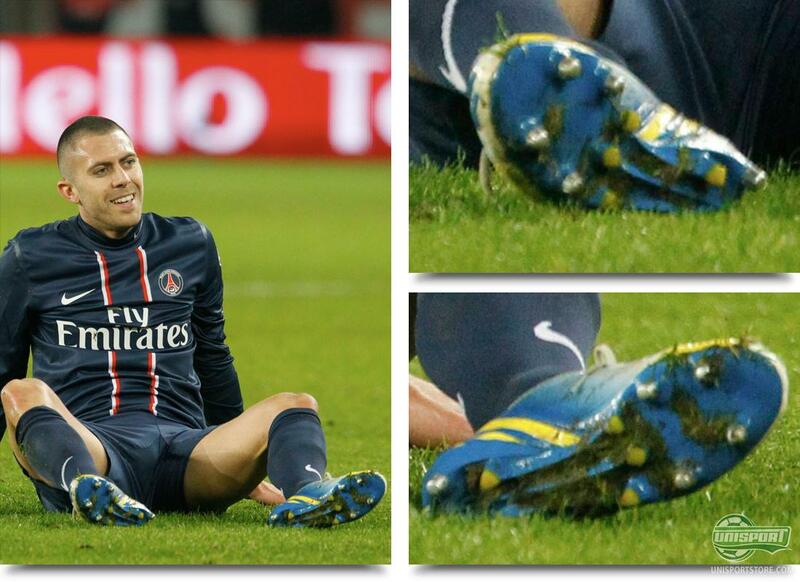 The French winger is an old F50 Adizero-player, but has since the Predators release, been a frequent user of that silo. This has however not been without a few reservations, as he has had a pair of specially produced boot's made with the old generation of Adizero outersole. You can tell this from the easily recognisable MiCoach buble's absence, that we have also seen Gareth Bale play without, but MiCoach or not; there can be no doubt, that they are both very quick on their feet indeed. 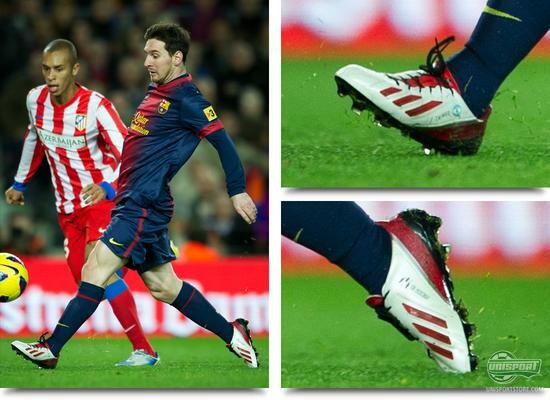 Lionel Messi (FC Barcelona)  Adidas F50 Adizero MiAdidas White/Red/Black The man on everyones lips at the moment is the little Argentine above. He washed away all recollection of Gerd Müller record for most goals in a calendar year, by adding further two goals to his name, bringing his tally up to 90. - That's 5 more than Müller. This was also done while wearing a pair of mega cheeky Adidas F50 Adizero MiAdidas-boots, that is the winning design from a competition, which Adidas launched earlier this year. It is a shame, that they wont be available for purchase, as it is a very attractive colour combination , but we can at least cross our fingers and hope Adidas take note. 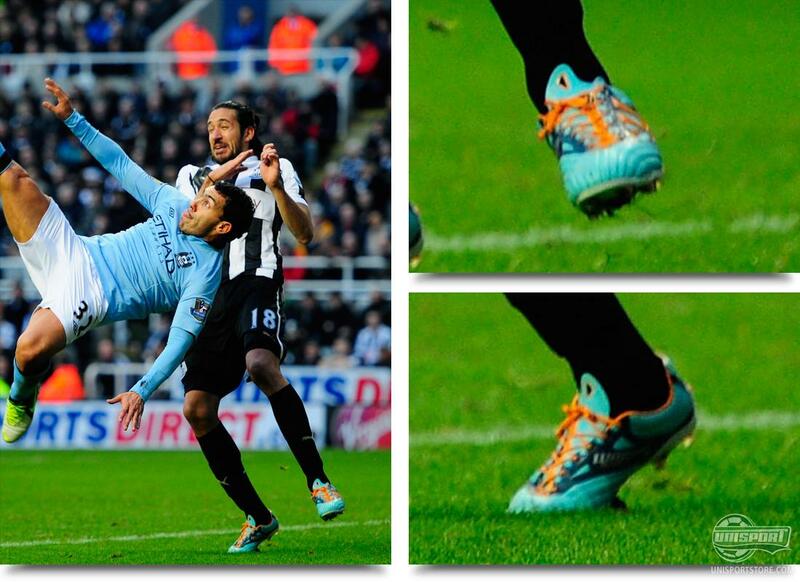 Jonas Gutierrez (Newcastle United)  Warrior Skreamer Pro K-leather Blue/Orange The new kid on the block is the American sports-mastodons from Warrior sports, that since the summer have been trusted with the job of equipping Liverpool. They have recently presented two new football boots and have already signed up quite a few big names, that will now be seen in their latest venture. One of them is Jonas Gutierrez, who aired his pair against Manchester City, but this is not without modifications. 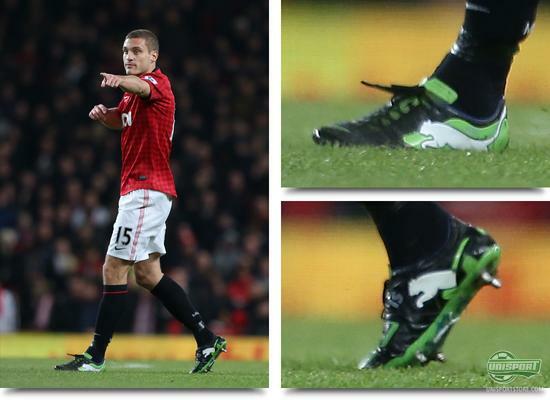 He has, just like Fellaini, had a pair of kangaroo leather versions made, but with the same colourway as the microfibre. - if only one had become a pro. James McClean (Sunderland)  Nike GS2 ACC White/Black If you regularly follow our boot spots, you definitely have noticed, that Sunderlands number 23, is somewhat of a favourite here at Unisport. This is because we suspect, that he is as much of a boot fanatic, as we are. He has during the season played in anything from the first Nike GS, to Adidas Predator LZ and all the way back to Vapor VIII CR7. 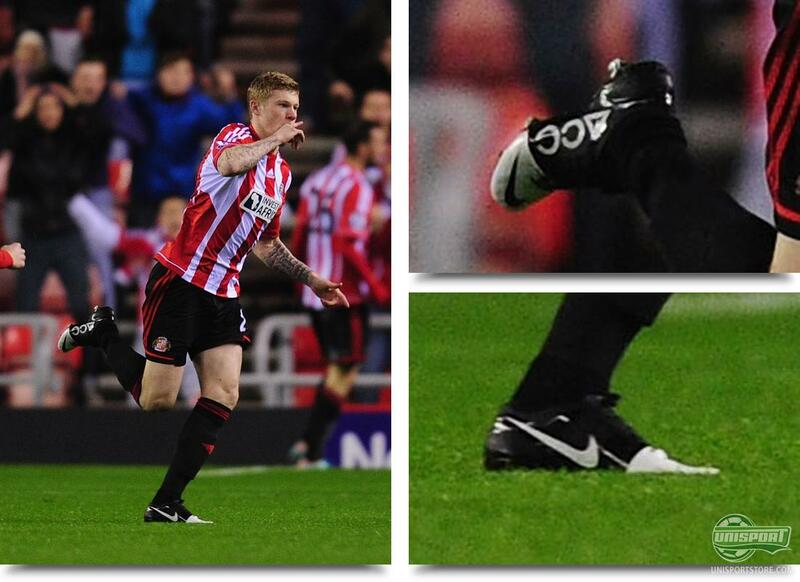 This is why, we couldn't help, but shed a little tear of joy, when we spotted McClean in the new Nike GS2 ACC White/Black and even score with it. We tip our hat and would also like to extend an invitation to James if he ever felt like stopping by our offices here in Denmark. Connor Wickham (Sunderland)  Nike Mercurial Vapor VIII ACC Retro/Total Orange/Challenge Red A little later in the week, The Black Cats visited Manchester United at Old Trafford and even if they went home empty handed, we still noted a good boot spot from Geordies. Yet another front figure for Umbro has defected. The young talent Conor Wickham has ditched his Umbro GT Pro and completed his move from the English brand to the American, former business partner. He played in a pair of Nike Mercurial Vapor VIII ACC Retro/Total Orange/Challenge Red, that really matches the away kit well. Nemanja Vidic (Manchester United)  Puma Powercat 1.12 Black/Green/White It was a much anticipated comeback for The Red Devils, when their captain finally returned to action. Half way through the second half, Vidic took to the field, for the first time since he got injured in last years Champions League group stages, in a game against FC Basel. The skipper has however not been slumbering when it comes to boots, as he had chosen the brand new Puma Powercat 1.12 Black/Green/White for the big occasion. 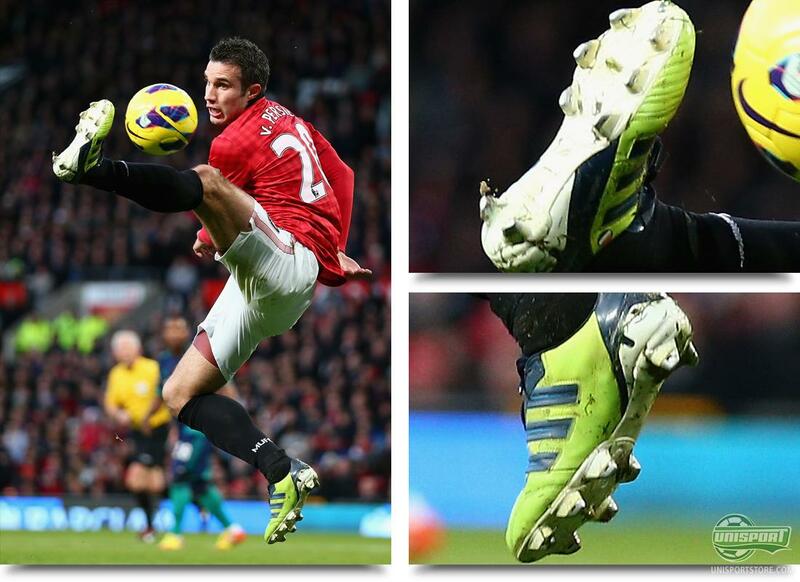 Robin van Persie (Manchester United)  Adidas Predator Adipower Slime/Blue Custom We have been furiously scratching our head, trying to make sense of The Flying Dutchman and his boot choice and after our last conclusion of it being a takedown-model, we've gotten a little wiser. It is in fact an Adipower, the top-model, but not quite like your average Adipower. It has a very special soleplate, that looks like something you would find on the very earliest Predators. The same goes for the SG stud-configuration, that is a particular system, with quite a long history, as it is more than a few years old. The special preferences can help to explain why Robin van Persie has been reluctant to change into the Predator LZ, but we will have to see what the future brings. We would like to start off by extending our gratitude, to all the big European leagues, for delivering football of the highest order, in and around Christmas, as it makes the wait a bit more bearable. We hope our boot spots can fulfil the same predicate. Which spot is this weeks best? What do you say to McCleans boot collection? Or what about Van Persies very customised Adipower? And Messis special fan-designed Adizero? Share your comments in the box down below.